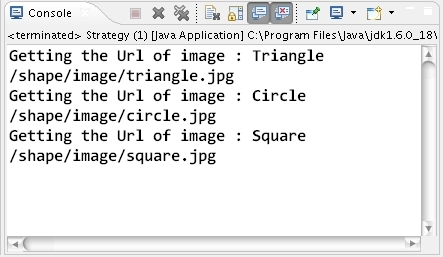 So what is a Strategy Design Pattern in Java ? A Strategy Design Pattern is a simple design pattern in java which provide us the design in which a particular piece of code behaves differently depending on the argument that we pass, is called as Strategy design pattern. Generally, there is a fixed part of the algorithm that is executed but varies with the type of strategy passed. In below example Shape object is the strategy that takes three different strategies and based on that gets us the urls of different shape.